In this photo provided by the Maine State Police, smoke and fire rise from an oil tanker crash on Wednesday, Jan. 2, 2019, in Belgrade, Maine. 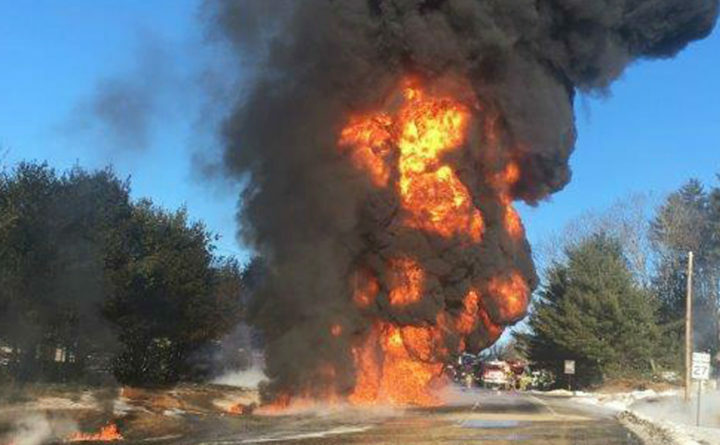 Officials say a tanker truck loaded with about 9,500 gallons of heating oil burst into flames following a collision. Two men are being credited with saving a truck driver’s life after a fiery crash last week on Route 27 in Belgrade. For postal workers Joe Arsenault Jr. and Nick Claudel it was just a normal day on the job, until they heard a loud noise and felt the post office shake. “I got outside, turned the corner here, and that’s when we noticed the tractor-trailer on fire,” Arsenault said. “As we were going out the back, I saw Joe turn the corner and I was like I’m following him, you know?” Claudel said. Moments after an SUV and fuel truck collided, Arsenault and Claudel went running to the scene. “We just went up to the cab and there was a gentleman standing up in there just totally dazed, trying to find his fire extinguisher,” Arsenault said. Despite the trail of fire on the road and the heavy smoke billowing into the air, the two pulled the truck driver out through the broken front windshield. “He was conscious. He was moving, maybe shaken up and hurt,” Claudel said. “He said, ‘My shoulder is dislocated or broke,’ and I said, ‘You need to get out,’” Arsenault said. Once the two helped the truck driver to safety, they stayed back as emergency crews did their job. “The most important thing was that when we got there the guy was in good health. It wasn’t catastrophic as we kind of expected,” Claudel said. The two say their previous military experience played a major role in the rescue. “It was just an instinct. My prior military training, I didn’t think anything about it. It was just to make sure nobody was over there that was going to get hurt,” Arsenault said. “I’ve seen some pretty similar styles stuff in Afghanistan but not here not at home, so it was definitely kind of a wake up,” Claudel said. They would not call themselves heroes, though. They just hope someone would have done the same for them. “I would say there are hundreds of other guys that are heroes in the area that would have done the same thing,” Claudel said. “It’s hard to explain unless you’re there. You just got to go ahead and do what you got to do and I would just wish someone would do it for me if that would happen to me,” Arsenault said. Arsenault and Claudel say after the rescue they controlled traffic before police came. Maine State Police say both drivers had minor injuries.